Football in the two World Wars has largely been overlooked by historians. It was only in recent years that the contribution of the sport to public morale during times of conflict was acknowledged. This replaced what was a feeling of discomfort about a mere pastime being continued during a time of intense strife. The game in the Great War has often been swept under scullery mats by those that felt it should have been abandoned until peace returned. The plethora of cartoons suggesting that football was, indeed unnecessary, underlined the mood of the time. Most football clubs ignored their “war record” and many record books simply pointed to “competition suspended”. Little wonder, then, that some clubs failed to mark their successes during what was a very low profile set of competitions during the wars. In the case of WW1, clubs played numerous regional leagues, which were largely poorly attended, especially in metropolitan areas where a large football crowd might be ready-made target practice for a bomb-laden airship. Chelsea, historically, paid little attention to their WW1 performance. Of course, football continued in its conventional format in 1914-15, despite a lot of criticism and soul-searching. On the flip-side, football did allow itself to become a recruitment centre for Kitchener’s army. Chelsea reached the FA Cup final in 1915, but they had also finished in a relegation position. Once the 1914-15 season was finished, football adopted a more austere model, and one of the beneficiaries in the south of England were “the Pensioners” as they were then known. With troop movements all over the country, Chelsea’s team, like most London clubs, had guest players appearing. Basically, if there was a chance to get a top name in your side because he happened to be barracked nearby, the club would take it. In Chelsea’s case, they picked up one Lance-Corporal C. Buchan. This was none other than Charles Buchan, who would later lend his name to Charles Buchan’s Football Monthly, and prior to that, would play for Sunderland, Arsenal and England. Buchan was an England international when he turned out for Chelsea in 1915-16. He had been a member of Sunderland’s 1913 team that so nearly won the “double”, but had to settle for “just” the league title. And he was widely regarded as the best player in the country. Chelsea knew all about him – he had scored twice against them in a 4-0 Sunderland win in 1912-13 and once in 1913-14. Buchan was a Londoner, despite playing for Sunderland. He was born in Plumstead and started his career with his local club, Woolwich Arsenal, and then moved on to Leyton. He transferred to Sunderland in 1911. Buchan, who was training to be a teacher, enlisted early on after war was declared. He was told that he was tall enough to be a Grenadier Guard and was sent down to London. In 1916, he was sent to the Western Front and saw action at the Somme, Cambrai and Passchendale. He would later win promotion to Sergeant and the Military Medal for bravery. The London Combination, a competition that morphed into the Football Combination, was run over two campaigns in 1915-16 – the Primary competition and then a supplementary competition. Chelsea won both. The first started on the opening Saturday in September, with Chelsea beating Clapton Orient 3-1 thanks to a hat-trick by Buchan. The crowd was 12,000. Chelsea lost just twice in the 22 games of the Primary, both single goal defeats, to QPR and Millwall. They finished seven points clear of second-placed Millwall. Buchan scored 24 goals in 17 appearances. “His rare ability as a dribbler has delighted thousands of spectators,” said the Athletic News when summarising Chelsea’s season. Chelsea’s team included Nils Middleboe, a Danish international who became a popular figure with the Stamford Bridge crowd. 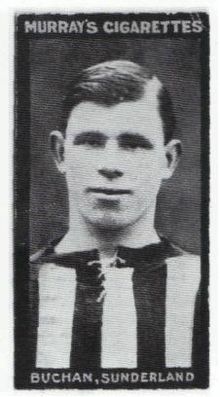 Middleboe, who was actually born in Sweden, played for KB Copenhagen and appeared in both the 1908 and 1912 Olympic football finals. He was ever-present in the Primary competition and barely missed a game in the Supplementary competition. Chelsea finished top of the second campaign, just one point clear of West Ham. They lost three of their 14 games, but had the satisfaction of beating Arsenal 9-0 at Stamford Bridge in front of 26,000 people. Buchan scored four times against one of his future clubs. In that second competition, he netted 17 goals, but he was not top scorer – that honour fell to one-eyed centre-forward Bob Thomson, who grabbed 25, including seven against Luton Town in an 11-1 victory. The Chelsea team was going its separate ways, though, responding to the call to arms. Tommy Logan, a tough centre half, was devastated when his wife died after just a few months of married life. He enlisted in the Argyll & Sutherland Highlanders. Charlie Freeman, a veteran inside forward, joined the flying corp and moved to Curragh Camp. Goalkeeper Colin Hampton was a Bombardier in the Army, while forward Harold Brittan was Private Brittan of the motor transport section by the time the season ended. Others were involved in valuable government work – Jack Harrow, a loyal Chelsea man, was employed making explosives and Walter Bettridge worked in munitions. 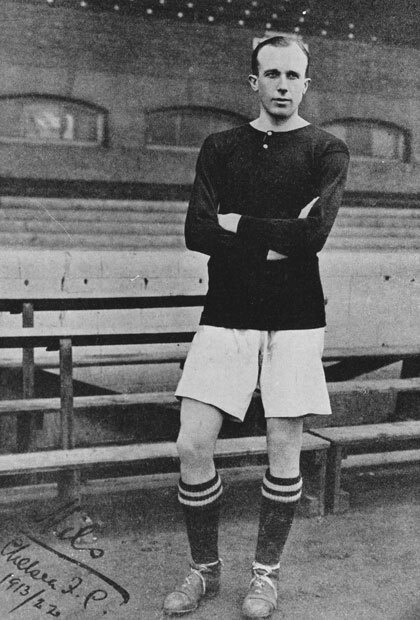 Another guest player was Cyclist L. Moores, a left winger from Manchester: “Very speedy but lacking resource.” Chelsea could also call on old favourites like Harold Halse, Harry Ford and Jimmy Croal. Manager David Calderhead tried to temper excitement about Chelsea’s success. He told Athletic News that his team had “played up to” Buchan and made the most of their star forward. He also underlined the role football had played in wartime Britain: “The playing of the game had served a useful purpose in many ways – especially in affording entertainment to the soldiers.” But Calderhead admitted that Chelsea had played “extraordinarily well and for pure football, no team wearing our colours has ever acquitted themselves so well.” Chelsea would do it again during WW1 – they finished top in 1917-18. Then, they would have to wait until 1954-55 to end a season in first place!